The Ferrari Mondial QV turns out to be an extremely durable car with appropriate care and maintenance. It is robust, and rust is only a minor issue. Some downsides are: the very high repair, maintenance, and replacement costs for the Ferrari owner. Thanks to very good rust prevention measures from the factory (dinol-sealing) the body of the Ferrari Mondial is considered relatively secure to the brown plague. With surprises in this regard not to be expected. Nevertheless, there are shortcomings in certain areas. Such as the lower part of the A-pillars where fender and door meet, corrosion can form because the foam sheet can hold standing moisture. 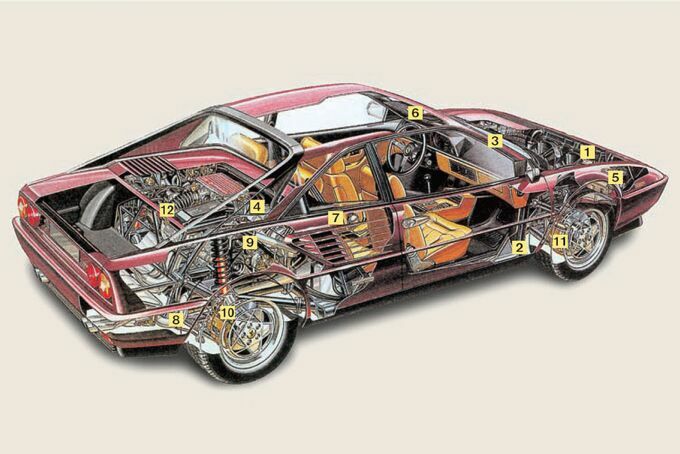 The tubular frame of the Ferrari Mondial will rarely find corrosion. The frame should be checked for traces accidents. Different gaps on the doors and hoods of the Ferrari Mondial indicate improperly performed repairs. The hood also deserves a close inspection.The clamping strips should be as tight as possible. Otherwise, what may happen is the folding roof gets wedged in the opening and thereby bends the thin rod. Another annoying thing, are clamping hood latch handles and non-functional Electric windows at the rear side windows, for which there are no spare parts. If these are broken, an expensive conversion kit including changing discs is inevitable. 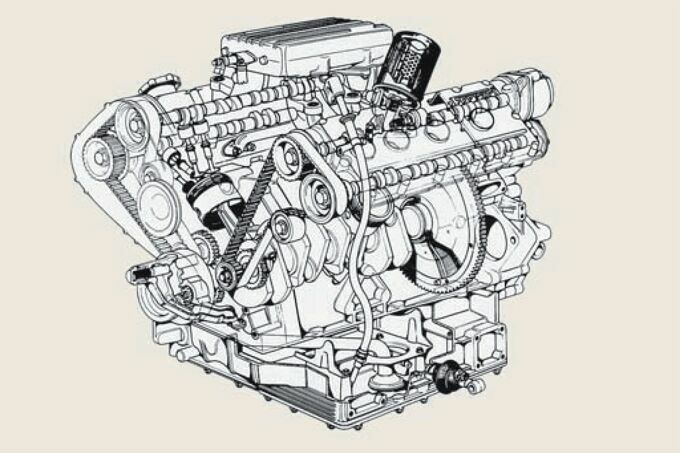 The Ferrari Mondial Electrical system is rarely a worry [Paul – yeah right I disagree]. If there are problems, they are in the form of non-working pop-up headlights. Many drivers complain that Mondials also have melted relays for the fuel pump in the fuse box, which spare parts not being hard to get. 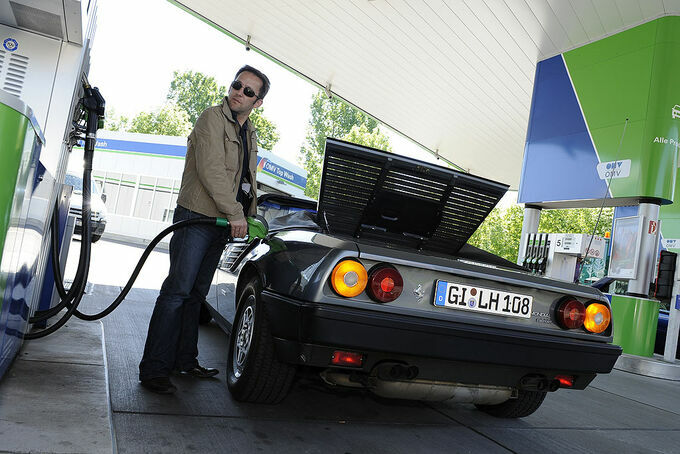 In more serious cases, the Ferrari Mondial’s only help is an electrician. The V8 engine of the Ferrari Mondial is considered stable and durable – a service life of 100,000 kilometers and more are doable with proper care. Every 35,000 to 40,000 km or every two years you’ll need a timing belt replacement. This is expensive fun – because a major can easily cost 3,500 to 4,000 euros. Due to high prices, repairs are often deferred. 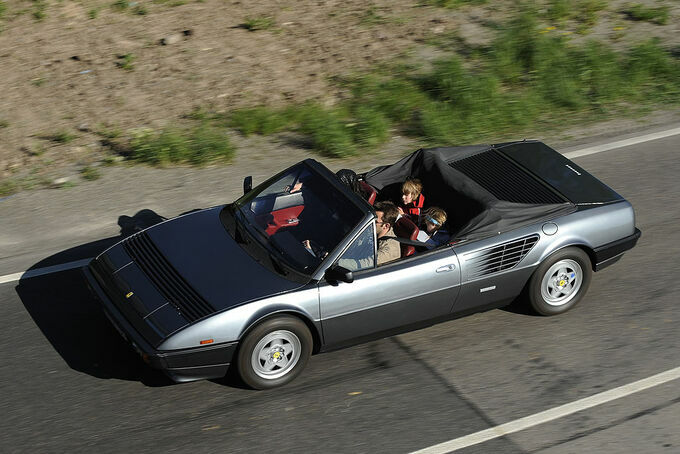 The Ferrari Mondial’s clutch is no match for the strong acceleration and high speeds for a long time. Use the fifth gear at low-speed gas and equally pay attention to speed and acceleration! Scratching noises during shifting from fifth to fourth and from third to second gear (at high speeds) suggest with very high probability worn synchronizer rings. Other possible defects in the Ferrari Mondial engine are leaking shift shaft, worn suspension bushes and damage to the brakes. Finding a good quality Ferrari Mondial is very manageable. The purchase price is in proportion to the maintenance costs, many owners who want to drive a Ferrari as cheaply as possible do not factor in maintenance. 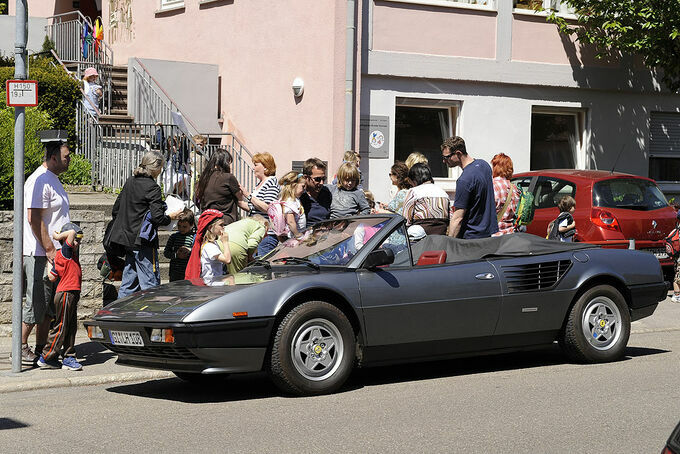 A poorly maintained Ferrari Mondial can easily make a low-purchase price a moot point. 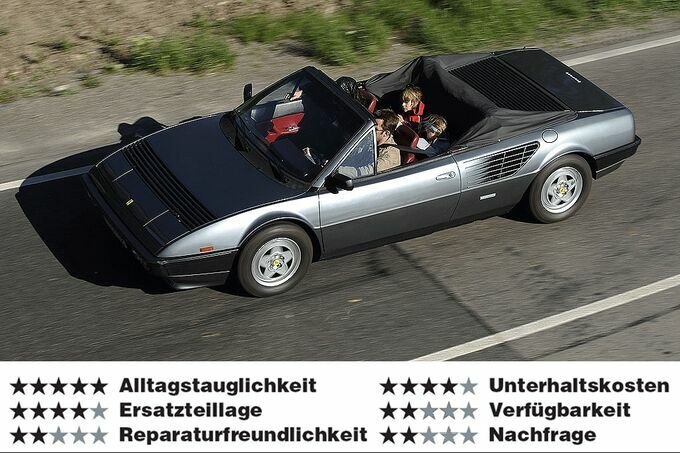 Ferrari Mondial QV can be found from around 17000-19000 euro. 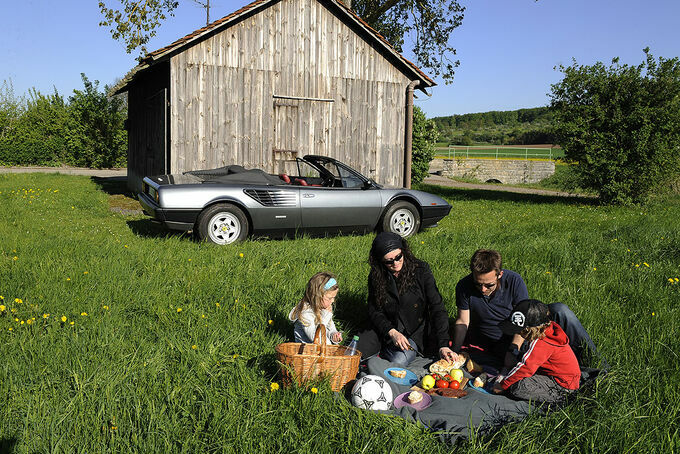 For those that want to play it safe, you should look for a well-maintained vehicle with verifiable history of privately held there from about 27,000 euros. For the Ferrari Mondial models with the 3.2-liter engine is expected at a premium of about ten percent. The supply of spare parts for the Ferrari Mondial is mostly available- but at very high prices. Washers, parts of the Bosch K-Jetronic or many body parts, however, are very hard to obtain. If you those parts, be prepared to go very deep into your pockets. 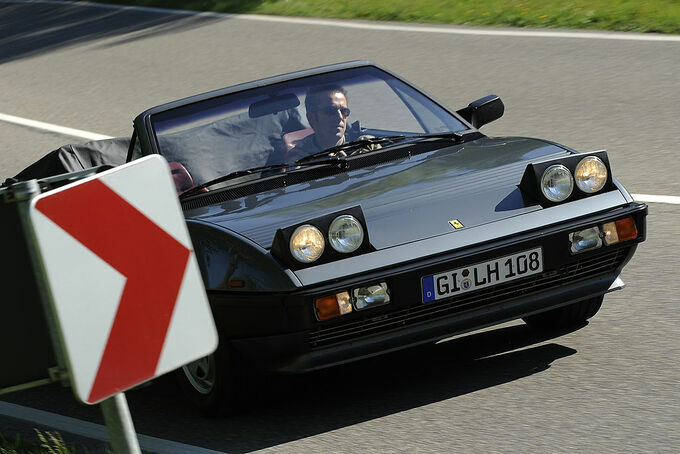 A front fender for the Ferrari Mondial for example, costs from € 1,400. If you need a repair, getting an accurate repair cost estimate is difficult. 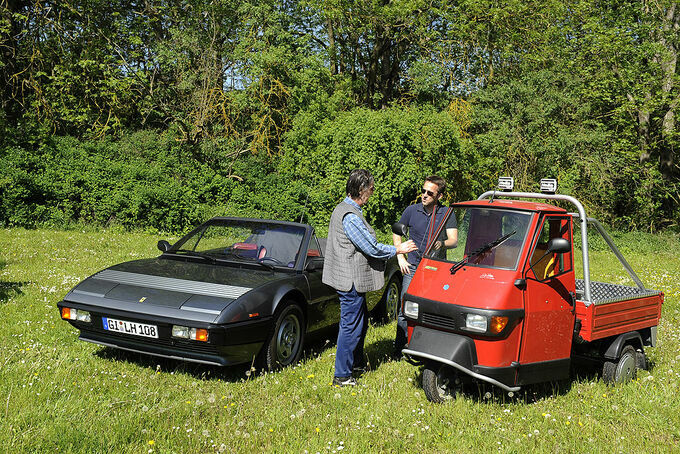 Expect Ferrari Mondial to be very expensive: What might be 500 euros today, could next week be significantly more expensive. 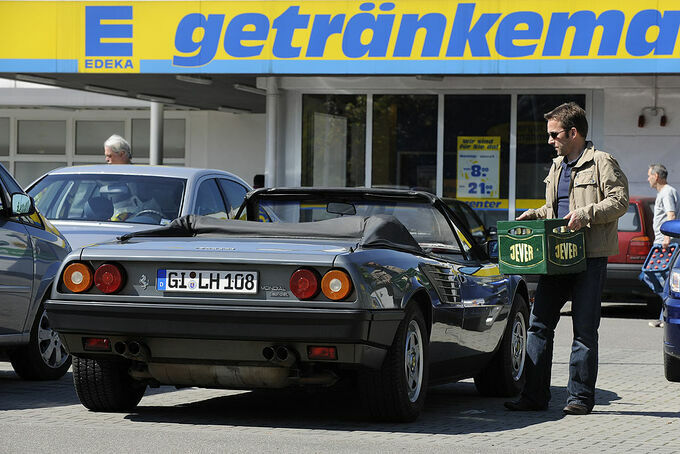 The mounted on the Ferrari Mondial TRX tires from Michelin go with a tire change also in the money: A set costs about 1,600 euros.